Indiana designated Salem limestone, (Calcium carbonate,) (quarried in south and central Indiana ) was adopted on March 1, 1971 as the Indiana State Stone. 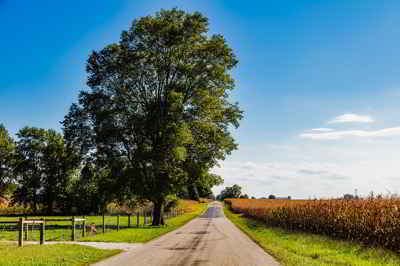 Bedford, Indiana is known as the "Limestone Capital of the World. "Limestone quarried and carved in Bedford is featured on famous buildings across America. The Indiana Statehouse not only houses the Indiana state stone sculpture, it is also clad in Salem Limestone. 35 out of the 50 Statehouses around the country also use Salem Limestone quarried by the Indiana Limestone Company. Limestone is a sedimentary rocks made up of layers of silt, small pieces of other rocks, and sometimes the skeletons of tiny creatures. In the middle of the Ordovician period, the first coral reefs appeared. Reefs existed earlier, during the Cambrian, but they were built by sponges and other organisms. The corals joined pre-existing groups of invertebrates, including trilobites, bivalve mollusks (similar to clams and oysters), snails, and cephalopods (mollusks related to today's nautilus, cuttlefish, octopus, and squid). Brachiopods were also abundant and diverse. Brachiopods have bivalve shells, but are not mollusks. The two halves of their shells are not symmetrical. They persist today, but are rare. Most died out during a mass extinction at the end of the Permian period (230 million years ago), when the shallow seas that had covered much of the continents began to retreat. The first fishes had just begun to appear in the Ordovician, but would not dominate the seas until the Silurian and Devonian periods. 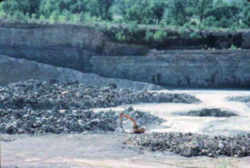 In much of eastern North America, calcium carbonate sediment accumulated in the warm, shallow continental seas and eventually compacted into limestone. Then, around 300 million years ago, the continents began to converge into the supercontinent Pangaea. The force of the long, slow collision between Africa and North America buckled most of eastern North America into a long, folded ridge, the Appalachians. The Ordovician limestones in eastern Tennessee were pushed into long, narrow, northeast-southwest folds. There are three basic types of rocks: sedimentary, igneous, and metamorphic. Sedimentary rocks are made up of layers of silt, small pieces of other rocks, and sometimes the skeletons of tiny creatures. One example of a sedimentary rock is the chalk you use at school. 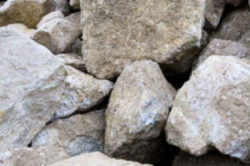 Another example is limestone, one of Tennessee's state rocks. The rocks you see inside caves are made of limestone. The Grand Canyon is made up of sandstone, limestone, and shale that have been eroded by the Colorado River to form the Canyon as it is today. Igneous rocks started as molten magma or lava and then cooled to become rock. Coarse grained rocks are formed when the lava cools slowly and fine grained rocks from when it cools faster. Some examples of igneous rocks are granite and peridotite. The Hawaiian islands are made of cooled volcanic lava called basalt. One of the most popular igneous rocks is an Apache Tear. Metamorphic rocks are rocks that have been changed by heat or pressure while forming. Sedimentary and igneous rocks can become metamorphic rock. Slate is used in blackboards, talc in talcum power, and soapstone for carving. 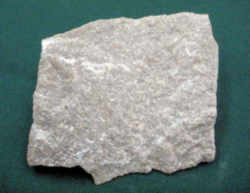 Limestone is a sedimentary rock composed largely of the minerals calcite and aragonite, which are different crystal forms of calcium carbonate (CaCO3). Most limestone is composed of skeletal fragments of marine organisms such as coral or foraminifera. Limestone makes up about 10% of the total volume of all sedimentary rocks. The solubility of limestone in water and weak acid solutions leads to karst landscapes, in which water erodes the limestone over thousands to millions of years. Most cave systems are through limestone bedrock. Limestone has numerous uses: as a building material, as aggregate for the base of roads, as white pigment or filler in products such as toothpaste or paints, and as a chemical feedstock. The first geologist to distinguish limestone from dolomite was Belsazar Hacquet in 1778. Color is extremely variable but generally white or colorless or with light shades of yellow, orange, blue, pink, red, brown, green, black and gray. Occasionally iridescent. Luster is vitreous to resinous to dull in massive forms. Crystal Habits are extremely variable with almost any trigonal form possible. Common among calcite crystals are the scalenohedron, rhombohedron, hexagonal prism, and pinacoid. Combinations of these and over three hundred other forms can make a multitude of crystal shapes, but always trigonal or pseudo-hexagonal. Twinning is often seen and results in crystals with blocky chevrons, right angled prisms, heart shapes or dipyramidal shapes. A notch in the middle of a doubly terminated scalenohedron is a sure sign of a twinned crystal. lamellar twinning also seen resulting in striated cleavage surfaces. 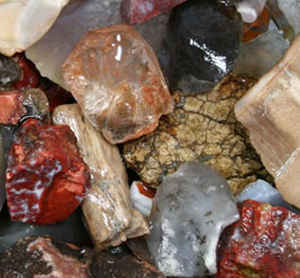 Pseudomorphs after many minerals are known, but easily identified as calcite. Also massive, fibrous, concretionary, stalactitic, nodular, oolitic, stellate, dendritic, granular, layered, etc. etc. Cleavage is perfect in three directions, forming rhombohedrons. Hardness is 3 (only on the basal pinacoidal faces, calcite has a hardness of less than 2.5 and can be scratched by a fingernail). Other Characteristics: refractive indices of 1.49 and 1.66 causing a significant double refraction effect (when a clear crystal is placed on a single line, two lines can then be observed), effervesces easily with dilute acids and may be fluorescent, phosphorescent, thermoluminescence and triboluminescent. 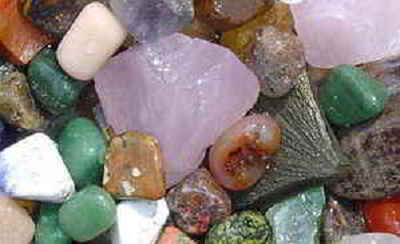 Associated Minerals are numerous but include these classic associations: Fluorite, quartz, barite, sphalerite, galena, celestite, sulfur, gold, copper, emerald, apatite, biotite, zeolites, several metal sulfides, other carbonates and borates and many other minerals. 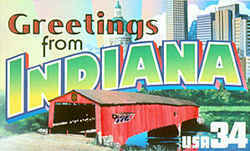 Notable Occurrences include Pugh Quarry, Ohio; Rosiclare, Illinois; Franklin, New Jersey; Elmwood, Tennessee; Brush Creek and other Missouri, Wisconsin, Kansas and Oklahoma localities, USA; Andreasburg, Harz Mountains and Saxony, Germany; Brazil; Guanajuato, Mexico; Cornwall, Durham and Lancashire, England; Bombay area of India; Eskifjord, Iceland; many African localities as well as others around the world with their own unique varieties. Best Field Indicators are crystal habit, reaction to acid, abundance, hardness, double refraction and especially cleavage. The law designating the regal type rock "Limestone" as the official Indiana state stone is found in the Indiana Code, Title 1, Article 2, Chapter 9, Section 1-2-9-1. Sec. 1. The regal type rock "Limestone" which is found and quarried in south and central Indiana from the geologic formation named the Salem Limestone, is hereby adopted as the official stone of the State of Indiana.